Born into a pious Athenian family, Saint Clement showed devout tendencies from his early childhood. When he reached the age of thirty, he renounced the vanities of this world and entered the Monastery of Myoupolis, founded by Saint Meletios (1 Sept.) on Mount Kythairon in Boetia. For three years he showed himself to be the model of a monk, by his obedience and humility. 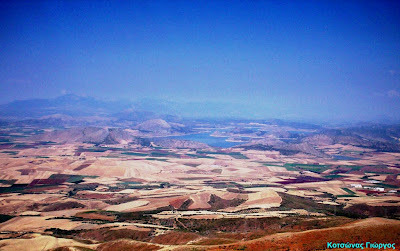 Moreover, he used to like to withdraw to pray in the solitude of Mount Sagmata nearby. His prayer was so ardent that he was caught by surprise one day by one of his monks, his spirit in ecstasy and his body raised above the ground. 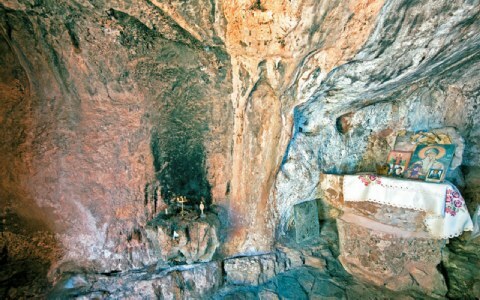 Wishing to flee from the admiration of men, Clement obtained the blessing of Saint Meletios to live in a cave, situated like a column on a promontory of Mount Sagmata. He spent many years there, in total retreat from the world, but the reputation of his virtues and of the grace which God granted him, attracted a growing number of disciples, who settled themselves either in the caves round about or in a small monastery situated nearby, in order to delight in his teaching. On the death of Saint Meletios, the monk who took on the direction of the Monastery of Myoupolis demanded that the ascetic return to lead the communal life. As Clement refused this, recalling that he had received the blessing of the former holy Elder to lead the life of hesyachasm, the abbot excommunicated him, and declared his name anathema. Not long afterwards, the latter fell ill, and realizing his error, asked to be taken to the ascetic to ask for his forgiveness. As his state of health did not allow for such a journey, it was whilst invoking the forgiveness of Clement that he gave up his spirit. 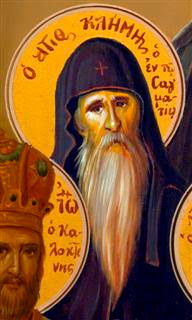 As a result, the reputation of the holiness of the ascetic of Mount Sagmata reached the ears of Emperor Alexios Komnenos, who gave as a gift to the now established Monastery of the Holy Transfiguration on Mount Sagmata a precious fragment of the True Cross. Coming to the end of his struggles, Saint Clement fell seriously ill, and after giving his last words of advice to his disciples, his soul passed peacefully over to the Lord in the year 1111. The Holy Skull of Saint Clement can be venerated today at the Holy Monastery of the Transfiguration of the Lord on Mount Sagmata. Preserved there also is the cave of Saint Clement. His holy memory is celebrated on January 26th with Saint Germanos of Sagmata, but due to the weather conditions of Mount Sagmata at that time, they are also celebrated together on May 1st. Sagmata Monastery is one of the most important 12th-century monuments, built on the summit of Mount Sagmation, at the height of 747 meters. In ancient times this mountain was called Ypation, since it is recorded that a temple and a statue of Zeus Hypatos stood there. It owes its modern name possibly to its shape, which gives the impression of a saddle from a distance, or due to the previous occupation of the monks with saddle-making. 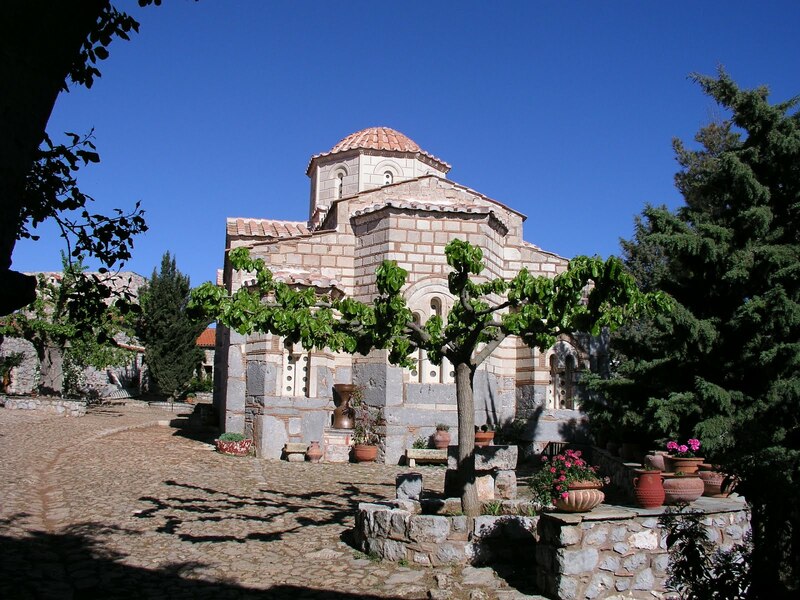 The founder of the Monastery was Saint Clement, initially a monk in the Monastery of Saint Meletios, from where he left to settle in a skete on the summit of Sagmata. 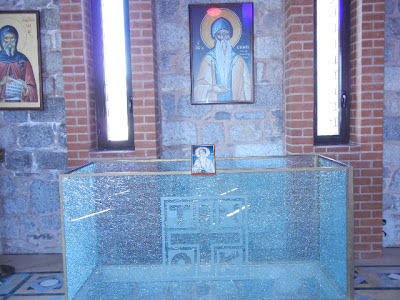 His relics as well as those of other saints are kept in the katholikon. Some financial support came from Emperor Alexios Komnenos, who granted a chrysobull in 1106. The Monastery generally retains a trapezoid ground plan. Four wings with cells and other auxiliary buildings surrounded a spacious courtyard, giving the impression from outside of a strong precinct. Almost in the center of the courtyard stands the katholikon. Around the Katholikon are built the cells, the dining hall, and the rest of the support spaces. Towards the south side is the dining hall of the Monastery, the “photanamma”, and towards the western side the first cell, all constructions of the 12th century. The rest of the buildings (cells, the archondariki, etc.) date from the Turkish occupation. The katholikon of Sagmata Monastery, dedicated to the Transfiguration of Christ, follows the classicizing tendencies that prevailed in Greece during the 12th century. It belongs to the architectural type of the complex cross-in-square church with dome, a characteristic Constantinopolitan type. To the west a four-columned lite is built and a later exonarthex. The most noteworthy portion of the church is the mosaic floor. It is beautiful, from the samples that remain, crafted with multicolored stones, depicting wonderful scenes from the animal and plant kingdoms, along with geometric shapes. The roof of the main church has lost its original form due to various additions, already since 1675, and were restored in the years 1971-72. However, the dome, destroyed by the 1914 earthquake, was not restored until quite recently, between the years 2002-2004.
b) Saint Clement's vaulted tomb, which was incorporated in the interior of a modern church, replacing an earlier one, built in 1974, to the south of the precinct. c) A single-naved church, to the south of the precinct, dedicated to Saint Nicholas. This small 16th century church has the shape of a free cross in the exterior with a semi-hexagonal apse to the east, while in the interior it forms a triconch. d) Around the Monastery are the ruins of old chapels, while at a distance of about 1 kilometer, next to the road, is the chapel of the Holy Forty Martyrs, which was built during the Turkish occupation. e) In recent years, the contemporary Russian Saint Luke the Surgeon, Archbishop of Simferopol and Crimea(1877-1961), became well known in Greece. Within the Holy Monastery is a chapel dedicated to St. Luke. Contained within are portions of his relics, his episcopal mitre, and some personal items. His memory is celebrated on June 11th. St. Germanos (1480-1540) – He served as abbot of the Holy Monastery during the bitter years of Turkish occupation. He was the spiritual father of St. Seraphim. His memory is celebrated on January 26th. St. Seraphim (1520-1602) – His family was from the town of Zeli. In his youth he came to Sagmata, and lived there as a monk for 10 years. For greater asceticism, he fled to the area of Domvou Elikonos, and built his famous Holy Monastery. His memory is celebrated on May 6th. Fr. Nektarios Antonopoulos (the Abbot of Sagmata Monastery), who routinely takes the Holy Relics to churches outside the Monastery, and gives many talks on the life and miracles of St. Luke of Simferopol . The Monastery knew days of wondrous spiritual greatness, and was a spiritual lighthouse for the region for centuries. Unfortunately, the national endeavors of later years did not leave the Monastery unaffected. The occupation by the Turks halted the processes of the Holy Monastery, along with other monasteries. Then, the Monastery was sacked and stripped of its holy treasures, which continued later by contemporary thieves. The buildings suffered the corruption of time, and the lack of men allowed considerable damage. The formerly multitudinous Holy Monastery remained with a few aged monks, who, without the necessary resources and difficult conditions, tried to salvage what was possible. From the 1970's, at the concern of Metropolitans Nikodemos and Ieronymos, and after, there began major restoration activities. The reconstruction had progressed to the point that the abandoned Holy Monastery had changed appearance. Since 1977, the Monastery has been inhabited by a small-numbered brotherhood, and functions as a male monastery. The Monastery is open to pilgrims daily from 7:30AM-1PM, and from 4PM until sunset.